An issue with a light fixture led to some smoke on Beacon Street. By Spencer Buell·	 4/15/2019, 2:33 p.m.
A small fire that broke out at a Brookline mattress store and spewed smoke along the route of the Boston Marathon was over quickly and didn’t injure anyone, police say. 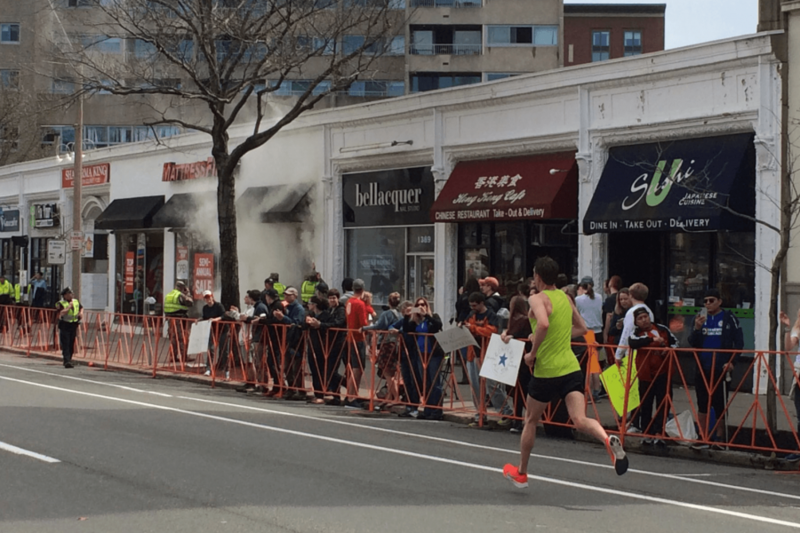 Photos of the fire shared on Twitter and the website UniversalHub show a tiny fire burning the corner of an awning, then a small cloud of smoke pouring out from the side of the building as runners make their way down Beacon Street. Police say a light fixture was to blame for the fire, which was out by the time firefighters arrived, and there were no disruptions to the race. Also along the race route, Boston police say they were able to quickly locate a 10-year-old girl who had been feared missing near the finish line. The department had shared photos on Twitter had asked for the public’s help in finding the child, and then, in a foll0wup tweet fewer than 20 minutes later, announced she had been found. Police also responded to an electrical failure involving a light pole near the finish line and the Prudential Center, which a BPD spokesman James Moccia describes as “very minor” and also didn’t cause any injuries. As of 2:30, Moccia says he is not aware of any marathon-related arrests.